If you make this recipe, be sure to take a photo and tag it #minimalistbaker on Instagram! We try and look at every photo you guys post, and it always makes our day when we see what you’re cooking up. Cheers, and happy fall! 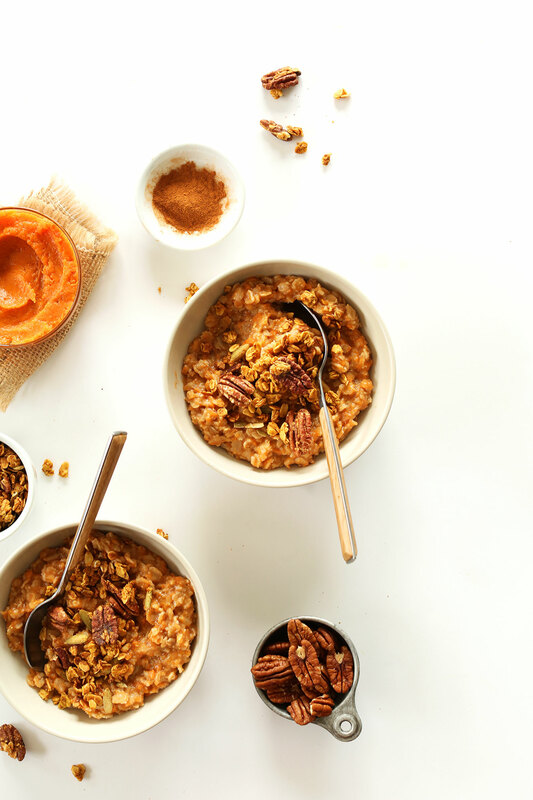 7-ingredient, 30-minute oats infused with sweet potato puree, cinnamon, and brown sugar. A simple, fast, and healthy breakfast option for any time of year, especially fall. 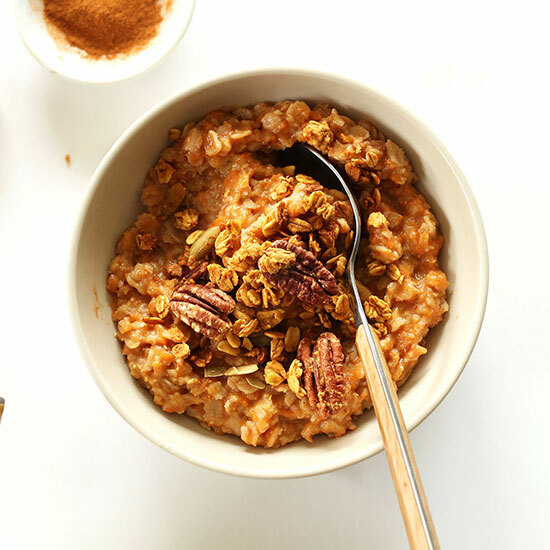 Divide oats between two serving bowls (as recipe is originally written) and sprinkle with Pumpkin Maple Pecan Granola (or roasted pecans). Add a drizzle of honey for more sweetness. Enjoy immediately. Best when fresh. It was very easy to make and I love all the ingredients seperately. It was just a bit disappointing when it was all put together. Now I want to make it for my husband but he leaves early for work. How can I make this in the crockpot? I’d want to place it at night so he can have it nice and hot in the morning. Help! Hi Kelly! We are glad you enjoyed it! While we haven’t tried making it in a crockpot and can’t say for sure, let us know if you experiment with it! In the nutrition space it says 1 serving, what is that equivalent to? 1 cup? Ps the recipe is delicious! Yes, 1 cup! Glad you enjoyed it! This is our new favorite oatmeal! It’s almost like enjoying sweet potato pie at breakfast without the guilt! I have to limit my sugar so I omitted the granola and added a packet of Splenda. Still very delicious. I’ve made it several times now and it’s a big hit with my family. Tasty! Tried it with a touch of molasses and McCormick Pumpkin Pie Spice. Try an overnight oat version. Mix oats and almond milk in jar and put in fridge overnight. Add sweet potato and rest of ingredients in morning and heat however you normally would. Hi Dana, I tried a quickie version with mashed sweet potato and rolled oats. YUM!!! Thanks for sharing. Just made the oatmeal this morning using date paste- it tasted absolutely delicious! Thanks for sharing the recipe, will make again! I think I just died and went to sweet potato and oatmeal heaven. I love both and I can’t wait to make this. YUM!!! I am eating a bowl of this right now! I already had a baked sweet potato in the fridge and googled vegan sweet potato breakfast. I did a quickie version…just added the mashed sweet potato to the uncooked rolled oats, stirred in the water and some cinnamon and ground flax, microwaved for 2 minutes and topped with pecans, a drizzle of maple syrup and almond milk. Literally took less than five minutes to make a delicious and nutritious breakfast. Thank you, thank you, thank you. Great post and pics, Dana! I just got the idea for combining yams and oatmeal last night, and your post gave me some good ideas for how to put it together. I did it without the pecans / granola / sugar (I used stevia), but it was still good. Thank you for doing what you do. You’re a blessing. I appreciate the others’ reviews about how great the food looks because it does, but in reality the picture does not do it justice. The recipe is sooo delicious. Just made it and it is a KEEPER❤️. Thanks so much for your recipes that you continue to share. Just made it, tastes great! And super easy. One tiny problem though: The sweet potato was hard to mix in since it was so thick. Any tips? Thanks! 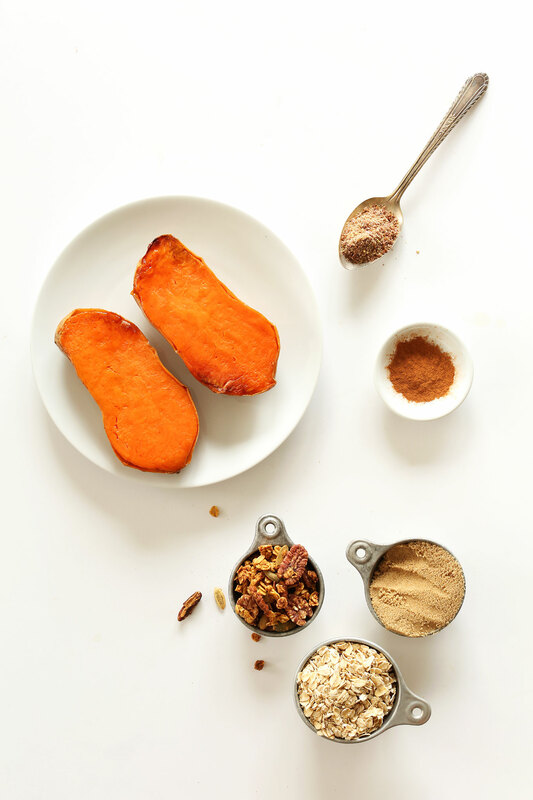 TIP: Make sure your sweet potatoes are very soft, then mash/puree before adding to the oats. 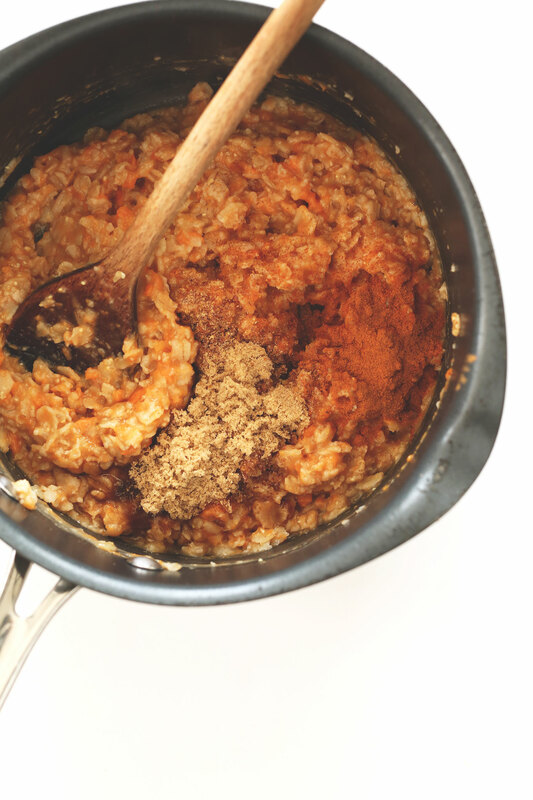 You can also add the sweet potato puree in the last 5 minutes of cookings the oats so it all melds together a bit better. Good luck! Could you make overnight oats with sweet potato? 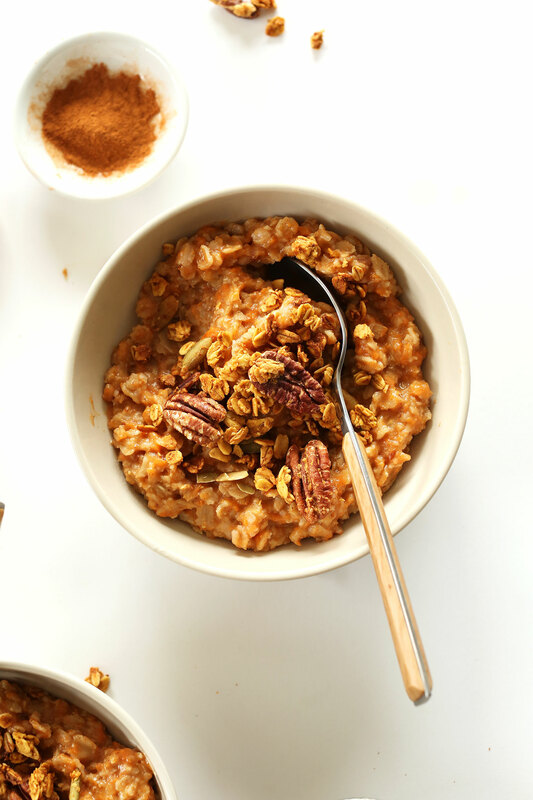 I read this as I was eating a big bowl of your Creamy Pumpkin Oats – can’t wait to make this new version! Yay! Hope you enjoy this new version, Heidi! I made this before school and it was amazing!! Thank you Dana! I love that its so fibrous yet sweet and delicious! All my favorite qualities in a bomb breakfast! OMG I’m loving this recipe idea. I have a feeling this is going to my favourite breakfast for Winter time! This oatmeal sounds delicious. I want a bowl for breakfast tomorrow! Too bad I roasted up my last sweet potato for dinner tonight. Gotta get to the grocery store. DO IT. Then report back! I need your professional opinion ;D Also, that free people outfit you had on in your instagram? TO DIE FOR!! GIMME! Thanks! You too Emilie! If your boys eat this, they will have super powers (not really, but maybe). Hugs! These sound amazing! So simple and healthy too. Now that the cold weather is officially setting in (it was 2 degrees Celsius in Toronto this morning!) I can totally see myself and this bowl of oats curling up on the couch together. Thanks for another awesome share! Yes!! 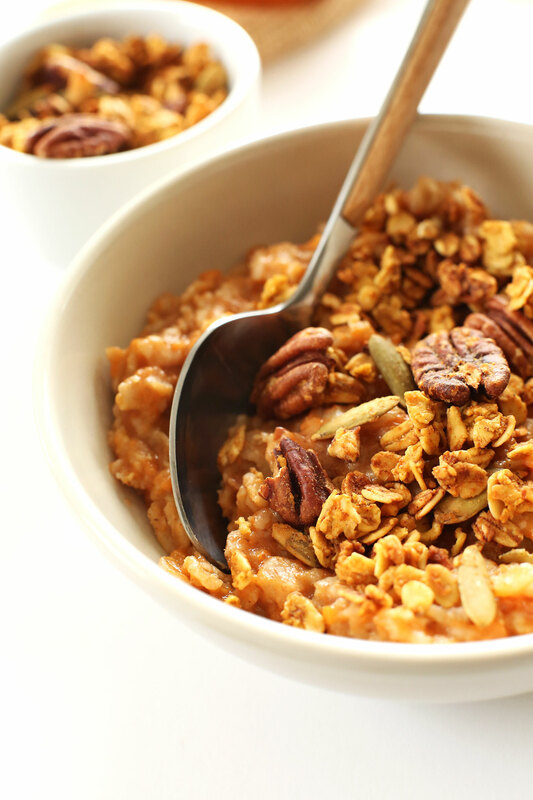 Sweet potato + oats + pecans = breakfast heaven. I recently made a baked version of sweet potato oats, and put a crunchy nut topping on it…and then ate the entire thing. I will have to try your stove-top version next!! Love this idea!! So happy that fall is here!! My sweet potato loving six year old would go nuts for sweet potatoes for breakfast! These sweet potatio pie oats look amazing, and their nutritional value and easiness of cooking makes them a must-have addition to the arsenal of every cook. 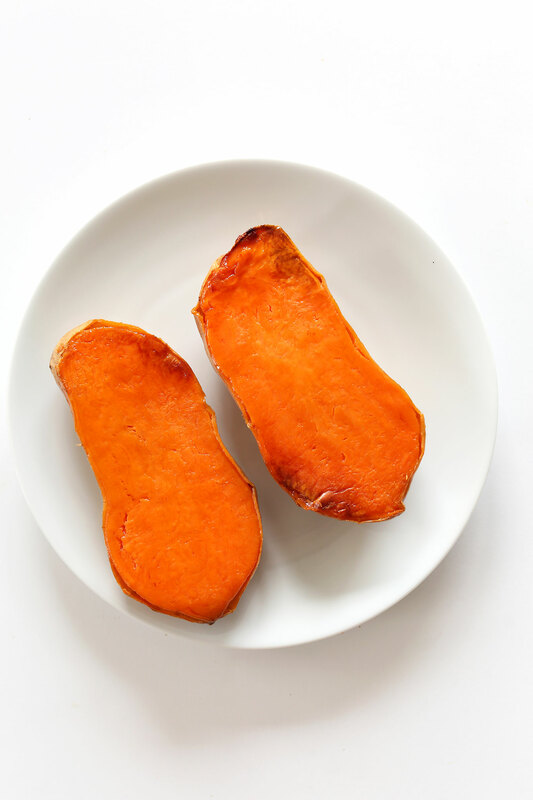 I am with ya…sweet potatoes deserve a spotlight at nearly any meal! In my oatmeal? Never thought of it but loving it. it’s my usual MO to top porridge with fruit for contrast, now I’m asking myself why the heck would I NOT top with crunchy granola to simulate a crisp/crumble? such a clever idea. I love it! I’d love to see a recipe for flourless cake! Sounds like a great oatmeal! 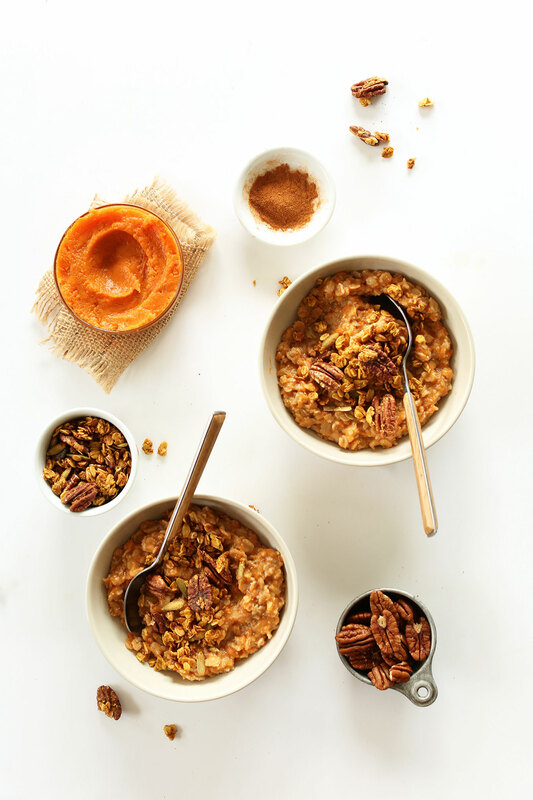 Whenever I have some pumpkin left I stir it into my morning oats – never thought to do it with sweet potato, what an amazing idea! And I LOVE your pictures, they are so stunning! Gorgeous photos! I love this idea. So cozy! Great pictures and looks delicious too! I obsess over oatmeal in the fall/winter months. Something about it is just downright comforting. And I am loving that you paired it with sweet potato! What a nutrient-packed way to start your morning! Okay, YUM! I look forward to my oatmeal every morning. It’s the one breakfast that never gets old! Right now my favorite toppings are blueberries, flax, chia, hemp, raw buckwheat, and sunbutter. But I might have to give this a shot!! I eat oatmeal for breakfast every morning, and I find it so fun to play around with all the different possible flavour combinations, but I have never tried it with sweet potato. I can’t wait to put a checkmark by this one because it looks delicious! About to become obsessed with this! Holy yum!